The Pearce Grip extension replaces the factory magazine floor plate and provides the extra finger groove for shooting comfort and control. Please Note: This unit replaces the factory magazine floor plate and provides the extra finger groove for shooting comfort and control. Glock Mid and Full Size model grip extension. Replaces the magazine floor plate adding grip length. Does not alter the capacity of the magazine. Model 19,23,32 and full size 9mm/40SW/357SIG. Also fits Model 37 GAP. Glock Gen 4/5 Mid and Full Size model grip extension. These extensions replace the magazine base plate providing better comfort and control by adding approximately 1/2 inch of griping surface. Will only work on gen 4/5 magazines that hace a capacity greater than 10 rounds. Glock model 26/27/33/39 grip extension. Replaces the magazine floor plate. Does not alter capacity. Glock model 26/27/33/39 grip extension. Replaces the magazine floor plate. Does not alter capacity. This extension is 1/4" longer than the PG-26. Gen 4 GLOCK model 26/27/33/39 grip extension. Replaces the magazine floor plate. Does not alter capacity. Glock model 26/27/33 plus extension. Replaces the magazine floor plate converting the factory model 27/33 magazines to ten round capacity and converts the factory model 26 magazine to twelve round capacity. All your State and local laws apply. Glock model 29 grip extension. (also fits M30 nine round mags) Replaces the magazine floor plate. Does not alter the capacity of the magazine. Glock model 30 grip extension. Replaces the magazine floor plate adding grip length. Does not alter the capacity of the magazine. Glock model 36 plus zero extension. Replaces the magazine floor plate adding grip length. Does not alter the capacity of the magazine. Glock model 26/27/33/39 plus extension. Replaces the magazine floor plate converting the factory model 39 magazines to seven round capacity, converts the factory model 27/33 magazine to eleven round capacity and converts the factory model 26 magazine to thirteen round capacity. All your State and local laws apply. An extension for the GLOCK 42. This extension replaces the magazine floor plate providing extra gripping surface for better control and comfort without altering the capacity of the factory magazine. An extension for the GLOCK 42. This extension replaces the magazine floor plate providing one extra round of capacity and approximately 3/4" additional gripping surface for better control and comfort while also incorporating the factory texture pattern. An extension for the GLOCK 43. This extension replaces the magazine floor plate adding approximately 3/4" additional length resulting in better control and comfort without altering the capacity of the factory magazine. This extension is slightly longer than the one provided by the factory (actual length 0.820") and incorporates the factory texture pattern as well as an ergonomic curve for better grip. An extension for the GLOCK 43. This extension replaces the magazine floor plate providing one extra round of capacity and approximately 3/4" additional griping surface for better control and comfort while also incorporating the factory texture pattern. GLOCK Magazine grip enhancer. Grip enhancer replaces the magazine base plate and retains all other factory components. Does not alter the capacity of the magazine and provides better comfort by filling the semi-circular cut-out in the lower front area of the grip body. Adds approximately 1/4 inch of gripping serface. Will not fit a non full metal magazine. Enhanced baseplate for Glock Gen 5 17/19/34. Provides better comfort by filling the semi-circular cut-out in the lower front area of the frame. GLOCK Magazine Extension. For use on all high capacity Non Full Metal Line and Full Metal Lined Glock magazines. Increases the capacity of 9mm magazines by 2 rounds. Increases the capacity of 40 SW 357SIG and 45GAP magazines by 1 round. Not for use on ten round magazines. GLOCK Magazine Extension. 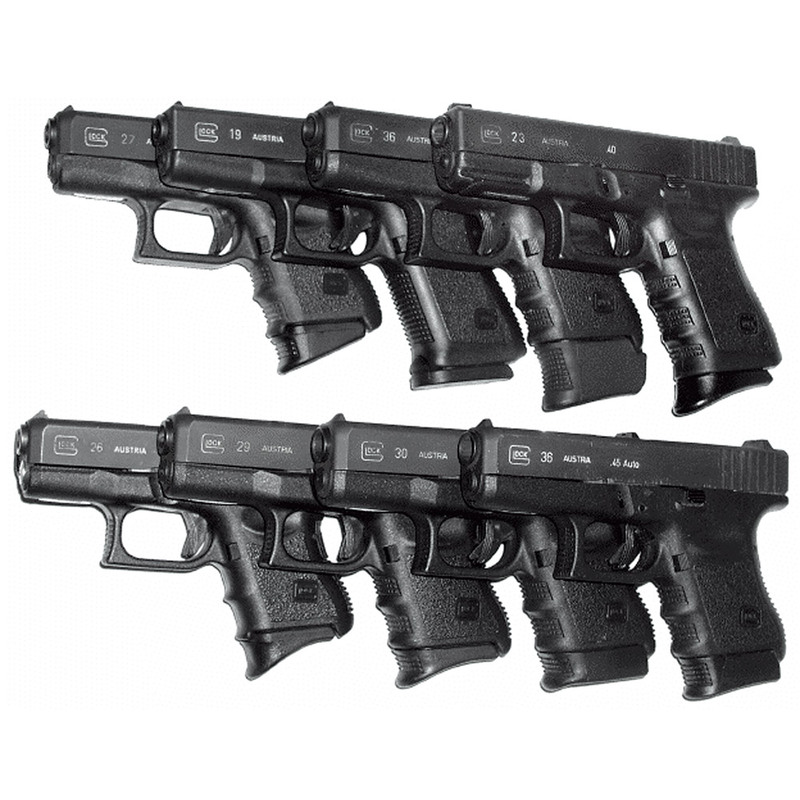 For use on all Mid and Full Size high capacity Full Metal Lined Glock magazines. Increases the capacity of 9mm magazines by 3 rounds. Increases the capacity of 40 SW, 357 SIG by 2 rounds and 45GAP magazines by 1 round. GLOCK compact and full size grip enhancer. Fills the cut-out in the lower front strap of the grip frame adding gripping surface. For use on all M20 and M21 magazines. Does not alter the capacity of the magazine. Featuring the same checkering texture as Gen4 Glocks, this unit adds capacity to Sub-Compact, Mid, and Full Size Glock high capacity magazines. This magazine extension replaces the original floor plate and internal locking plate and adds two rounds to a 9mm; two rounds to a 40SW and 357SIG, and one round to a 45GAP magazine. This unit will not fit the 10mm or 45ACP models. This extension replaces the magazine floor plate adding two rounds capacity to Glock factory M20,M21,M29,M40 and M41 magazines. This unit is for use on high capacity magazines only, it will not work on the 10 round M20 and M21 magazines or Glock M30 10 round magazines. This unit WILL fit on Glock M30 9 round magazines, increasing capacity to 11 rounds. This extension works on both Gen3 and Gen4 Glocks. Except product provides extra grip space while maintaining concealablity. I have used on many of my handguns and have had zero reliability issues unlike some extended base plates. I had the Pearce grip extensions for my Glock 30. They provided just enough length to the grip to fit the pinky and made shooting the pistol more comfortable.